Then Darian shows up in her room late one night. He has escaped the Terrorscape—a nightmare machine used to punish all Noncompliants—and he needs Desiree's help. What he tells her rocks her world to its core and makes her doubt everything she's ever been told. With this new information, will Desiree and Darian be able to escape the Protectorate before it's too late? There are several words that I could use to describe Awakening; fun, adventurous, terrifying. emotional. All of these are great descriptors, but they really don't do this awesome story the justice it deserves. As always, I am hesitant when I start a book by a new-to-me author, especially dystopians. Books like this one make me happy that I am still willing to give them a shot, despite of that hesitancy. I had a BLAST reading Awakening, and I can't wait for the next book in this awesome series! Desiree Six Haven is a Sheep. She believes everything she has ever been told about the world that she lives in. She believes that the Protectorate is there to make every life a happy life, to take away the pain and suffering that happened in the Manic Age. The Protectorate chooses your life mate, they choose your date of death, your career. All you have to do is comply. It never crossed Desiree's mind to do otherwise, until a series of events happened that made her start to question everything. And those questions will change the course of her life, in drastic ways. She loses her innocence, and so much more. But will she gain Freedom? Desiree was a fantastic character. She was human, she was a teenager, and she acted like one. She was also strong. She has a lot dumped on her, and the realization that her so much of her world was lie, was a huge blow. But she weathered the storm, and became a great heroine. I think we will see more of that in the next installment. When Darian shows up, she doesn't automatically believe what he has to say. But there have been questions in her head, and she didn't just blow him off. She searched for the truth, and she found it. She is a brave MC, and the type I would love to see more of in YA. Darian was also a great character. I loved him! He has been through unimaginable things, and yet he still has the ability to smile, and survive. He loves "Rae", and he is protective of her, but he also knows that she is capable. I loved the flashbacks to their childhood friendship, and I loved the development of their romance. And it is a sweet romance, forged in steel. Awakening truly is a great book. I enjoyed every single minute that I was immersed in this world. Shannon Duffy has the great ability to bring characters, and stories to life. She wrote a story that jumps right off the pages. The world-building was excellent, characterization was excellent. Man, I just have a serious love of this book. I wish that the sequel was in my hands, because I would be devouring it, asap. Thanks to YA Bound Book Tours, and the awesome author, for allowing me to be a part of this tour. 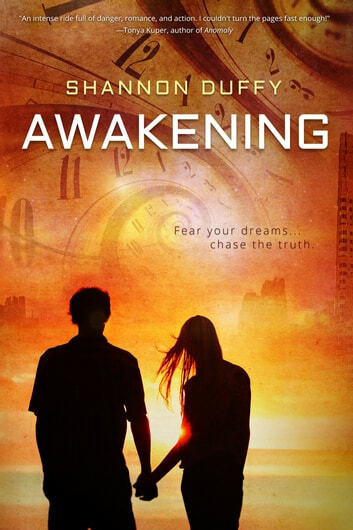 Shannon Duffy is one of the few authors that is on my auto-buy! I have been waiting for a dystopian to get me out of my dysto-funk, and this one just did it! I would recommend Awakening to you if you are an adventure lover, a romance lover, a dystopian lover. If you love great characters, and world-building, with great pacing, and edge of your seat moments, I think you would love this book. There is some mild language, in a few instances, but other than that it is a clean story, great for teens. And adults, like me, too! It's been awhile since I've read and enjoyed a YA dytopica as much as I did this one. Contemporary has taken over my TBR list lately and I've been craving something different. This landed in my inbox from Entangled Teen and I thought, why not. So glad I decided to read it. This world that Desiree (Rae) lives in is our world. It's been manipulated by people who claim to want to keep us safe. They are protecting us from our nightmares. With the invention of the dreamscape, people are regularly brainwashed to believe what the beloved Protectorate determine is best for the people. The day of the week determines the day you will die. Your job is decided for you. You mate is decided for you. Only one child is allowed. And the sheep are grateful and happy for it. It's a sad commentary on what results from lack of choice. Rae is a brilliant artist but was told she is a nurse. She's fed dreams of her soon to be mate, but is unhappy to find it's the boy who tormented her as a child. And her childhood friend, the one who protected her from everything, he's accused of killing his parents and has escaped from the Terrorscape. Things just are adding up to Rae. But it can't be the Protectorate, right? I loved these characters. Rae is strong and daring despite her very planned world. She questions and she has a mouth on her. I was cheering for her. And Darian? Love him. That boy loves to protect Rae, his sunshine. And he wants to fight because he's not like everyone else. And the fact that he's escaped from the Terrorscape and lived to tell the tail is not the only reason. Mostly, I loved these two together. Darian loves Rae. It's pretty clear. And there are kisses. I so love kisses. And he's kinda of territorial about Rae even if she has a different bondmate. She's his. That much is clear. Filled with some interesting twists and turns, this story took a direction I wasn't expecting. It feels like the beginning of a great series. I hope there will be more. The ending is perfect. Yeah, it ends with an ending but it has this little surprise that makes you hope for more from this world. I guess it's a cliff hanger but it's not one that you throw the book over. This is the perfect read if you're looking for something different, something more. Something that involves kisses and a world that could happen. Something you just look forward to reading. Something that intrigues you and surprises you. Something that has some demons lurking but also has a guy that's willing to fight them. That kind of book. A great read.